According to the artist’s daughters, this composition ‘Daughters of God’ depicts one of the artist’s friends on the right and their seamstress on the left. Their appearance reveals the young women’s differing social class. As in many of the artist’s paintings featuring women, we can see her interest in capturing the inner character and psyche of the women she is portraying. She focuses on rendering their emotional world, thus depicting the eyes as the window to the soul. The expression on the young seamstress’ face reveals a pensive, melancholic mood which is found in many of the woman that Loukia Nikolaidou Vassiliou painted. The title of the piece gives it an enigmatic character and reveals the relationship the artist had with Paul Gauguin and Symbolism; the title is important in our understanding of the painting. As in all her compositions, she goes beyond the visual experience, exploring the deep secrets of the human thought and soul. The title encourages the viewer to stand before the piece and discover the ideas and symbolisms hidden in the figures. Loukia Nikolaidou Vasiliou was born in 1909 and was the first Cypriot woman to receive an art education. She studied in Paris in the Colarossi Academy and at the Academie Nationale de Beaux Arts, during a time when very few Cypriot women received any kind of higher education. Her art was inspired by Postimpressionism, particularly that of the School of Paris. 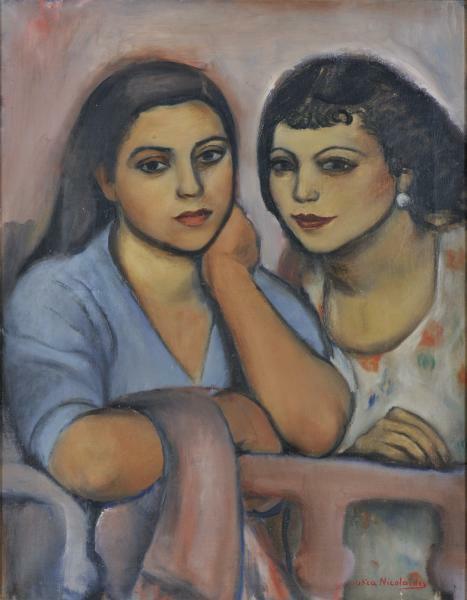 Returning to Cyprus in 1933, the direction her art took, particularly thematically, was influenced by the principles of the conservative society and the perceptions of females at the time. Like most women during that time, her social life mainly took place in the private sphere. Inevitably, much of her work was drawn from and inspired by a family and friend orientated environment. The world of women and their inner psyche were of particular interest to her.